Type of exercise: The recommendation to exercise generally refers to things like walking, running, cycling, swimming, or any rhythmic activity that gets your heart rate up (preferably into your target heart rate zone). Most people start with a basic walking program, but you should choose things you enjoy and that you can see yourself doing on a regular basis. 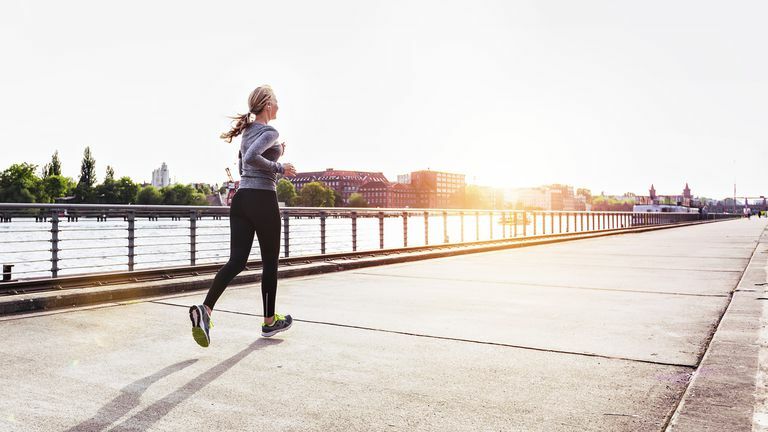 Moderate intensity: Moderate intensity usually means you're working at about 60 percent to 70 percent of your maximum heart rate, or what would be a level four to six on this perceived exertion scale. That doesn't mean you only have to work at this level. Throwing in some high-intensity bursts throughout your workout is great for your heart (not to mention your calorie-burn) and longer, slower workouts at a lower intensity have great benefits as well. Incorporating a mix of intensities will keep things interesting while benefitting your heart even more. Amount of time: To improve overall cardiovascular health, the American Heart Association suggests at least 150 minutes per week of moderate exercise or 75 minutes per week of vigorous exercise (or a combination of moderate and vigorous activity). An easy goal to remember is 30 minutes a day, five times a week. You don't have to do it all at once; benefits will also come if you split your workouts into two or three segments of 10 to 15 minutes per day. Don't skip exercise just because you can't do 30 minutes. Any movement is always better than nothing. Don't be afraid to be creative with your time or to start small. Start where you are, not where you want to be. Most days of the week: Like the other exercise elements, how often you exercise is up to you, what you can handle and what your schedule allows. If you're a beginner, you may start with three days a week with a day of rest in between. More advanced exercisers may do something every day of the week. The more you exercise, the more you'll want to exercise so, again, start with what feels good to you and go from there. Get rid of excuses. One popular reason we skip exercise is that we have other, more important, things to do. Now that you know how little time it takes and how much stronger your heart will be, you can finally put this excuse to rest. Focus on health. Imagine your heart pumping more blood with each beat, the oxygen rushing through your body, all the energy you're building every time you move. Visualizing all the positive things happening inside your body can help you follow through with your exercise commitments. Keep it simple. It's easy to get overwhelmed by all the exercise choices but, as you can see from the recommendations, it doesn't take much to strengthen your heart. Start with a simple, accessible activity and decide when, where and how you'll fit it in each week. All you have to do is stick to that schedule and add more when you're ready for it. Be flexible. If you can't get your workouts in, think of other ways to be more active. Walk extra laps at the grocery store or the mall, skip the escalators or take the dog for an extra-long walk. All movement is good for your heart, even if it isn't a structured workout. Fogoros, Rich, M.D. "Common Symptoms of Heart Disease." About Heart Disease. Medicine Online. "How Strong is Your Heart?" Medicine Online. Muth, Natalie Digate, MPH, RD. "Heart Disease: Is There a Gender Divide?" IDEA Fitness Journal, Nov-Dec 2007. Roberts, Scott.o. "Heart rate response to exercise - Tech Brief." American Fitness.